Shirts With Random Triangles: Jim Delany tries to stay upbeat despite awful Week 2 for Big Ten. 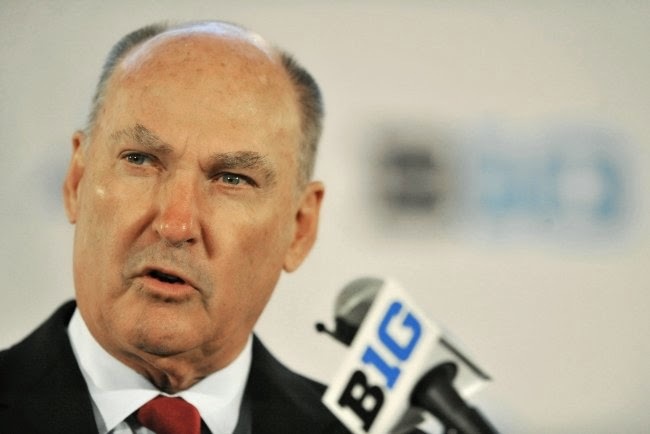 Jim Delany tries to stay upbeat despite awful Week 2 for Big Ten. Jim Delany. Via Bleacher Report. Week 2 of the 2014 college football season is one the Big Ten probably wants to forget. The conference went 0-3 in high-profile out-of-conference games (Michigan St. @ Oregon, Michigan @ Notre Dame, Virginia Tech @ Ohio State). The Michigan St. loss was considered a blow to the B1G's chances of getting a team in the first College Football Playoff. Amid a lot of frustration, Big Ten Commissioner Jim Delany is trying not to let the three losses bring him and the B1G's CFP hopes down. December 7 is the day that the CFP Selection Committee will announce the four teams selected to take part in the first College Football Playoff. It's also coincidentally the day that the Japanese bombed Pearl Harbor. But this isn't the place to psychoanalyze Delany's comments.